On the radio, the Shadow had a girlfriend named Margo Lane. It took a long time for Margo to become an agent/girlfriend in the pulp magazine, but she eventually became part of the legend of the Master of Darkness. In this graphic novel, the Shadow is up against an implacable foe known as the Red Empress. Her control over the tongs of Chinatown is vast, but her identity is a carefully controlled secret. Both the artwork and story are excellent. There is the feel of one of the old pulp novels, and the big bad very plausible. The inevitable showdown has a number of surprises that I will not spoil. All I will say is I didn’t really see this one coming! Matt Wagner seems to have a firm grasp on how the Shadow should look. I really liked the statement by the Shadow that his invisibility relies on “stillness,” focusing the mind and body so that people will not see him. Excellent! A touch of the mystical aligned with physical control makes a great explanation of the Shadow’s abilities! 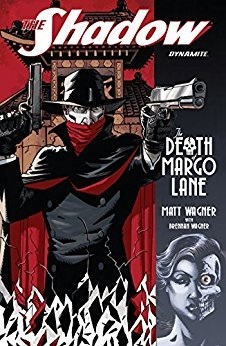 Wagner shows in this graphic novel that he has respect for the Shadow’s origins in pulp fiction. He has made this book one that could have walked out of the Shadow Magazine. I was impressed. Good show, Matt! I give this addition to the Shadow mythos five stars!